I am strongly contesting the information provided in the RR1 Sabal-Trail-Project initial Draft PF — final PDF, Accession number 20131115-5084, docket number PF14-1. Sabal Trail has not met their commitments to provide information to me, the property owner. Their filing exaggerated their efforts to contact and respond to property owners concerns. My impression is the landowner consultations are motivated to extract an agreement from the landowner for the survey. I have submitted questions to Sabal Trail representatives at the October 16th Open House held in Valdosta, Georgia and I am still waiting for a response. I have more information regarding interactions with Sabal Trail recently regarding this request that would be too involved to detail in this filing. My desire is to be as well informed as possible so I can make an educated decision about my level of cooperation with Sabal Trail; however, the process to gain this information from Sabal Trail is frustrating and exasperating. You would think they would want to be supportive and cooperative instead of creating an environment that is convoluted and complex. I have also called the HOTLINE requesting information from Kitty to never have received a response. When I spoke to Kitty at the Albany Compressor station and queried why I was never contacted, I was advised that my inquiry had been passed along to a land agent. I advised Kitty that I directed my question to her and have an expectation that she respond. I still have not been contacted by Kitty with a response to my question. The Open House meetings are insufficient as an outreach program. I hope Sabal Trail will not be given any credit for meeting their requirement for community education. At the Albany compressor station meeting they felt that only those individuals who live within ½ mile were worthy to be contacted. What is the distance from the compressor station that FERC would consider as an acceptable range in which to notify and educate the people? What was their strategy for selecting a 1/2 mile range from the compressor station as the criteria for notifying those residents and businesses for the Open House? Can you provide enlightenment as to why so few people were contacted in general to the open houses? 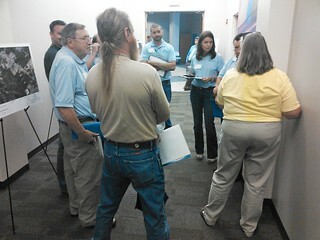 How is it that there are more Sabal Trail employees are at a meeting than the public? This is a testament to the poor level of penetration into the community in their attempt to “educate”. Add that to their delinquency in providing responses to inquiries submitted to them by the public it raises strong concerns. This is unacceptable and there should be consequences for this lack of response. It is critical that the community be informed and an aggressive program should be implemented to ensure awareness of the proposed pipeline is known and timely responses to questions. With the upcoming meeting, what will those formats be? How will the community be advised? Andrea advised she would be willing to use additional forms of announcements such as TV and radio ads. Can you please find out specifically what Andrea’s plan to improve their notification process. Regarding those meetings, what is the format they plan to use. Will it mirror a town hall, in which individual will have an opportunity to ask questions after a presentation to the entire group? I spoke with their associate general counsel, Mr. Teague, requesting more information on what governing bodies in Georgia were contacted to approve or have awareness of this process. In this discussion, I was told permits would be requested. I asked to what agencies these request would be made. I was told that I was early to the processes and that information would be available in about 1 ½ years from now. I advised this process is not new and there should be a standard protocol on whom and when during this process agencies are contacted. How is it that they can demand information from me (i.e. survey) but suggest that I wait for 1 to 1½ years to get the information I need to understand this process. I also requested what the impact area would be if the pipeline exploded. The representatives at the compressor station meeting advised they had no idea. What level of confidence should I have in a company that installs pipelines but has no knowledge of what the impact would be if the pipeline was breached and exploded? I provided my telephone to Mr. Teague of 229 251-4862 to be contacted on when he has this information available. FERC is the only governing agency that I have found that can ensure the interest of all parties is fairly managed. Your charge is to ensure that these corporations meet their obligations outline in their filing. The limited scope of their audiences for Open House meetings, delinquency in responding to stakeholder’s concerns and the minimal efforts to bring awareness to stakeholders and the community is disturbing and unacceptable. These multiple situations are evidence of their failure to comply with the commitments outlined in their pre-filing request. 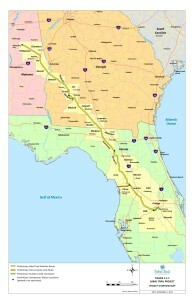 I am requesting that FERC suspend all activity by Sabal Trail until these deficiencies have been managed. I have addresses these concerns previously to FERC. The growing number of inadequacies leads me to request again that FERC intercede. To allow the continuance of their efforts would be a grievous injustice to all stakeholders and especially the property owners. I am requesting to be contacted regarding this ecomment filing by FERC. Curious that Sabal Trail says they’re not contacting permitting agencies when they already filed back in October a list of permitting agencies they’re contacting, and in their 15 November 2013 filing they included a table of agencies with specific permits listed that they were working on getting.